Fancy a new look? 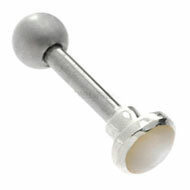 Our steel belly button jewellery makes it easy to add a little glamour to your piercing! We have a huge choice of high quality surgical steel belly button jewellery including bananabells, belly bars and belly button rings. Surgical steel is a fantastic material for belly jewellery because it is biocompatible and inexpensive. It is very comfortable to wear and can be worn even in freshly pierced belly buttons, so your navel can look fabulous from day one. These steel belly rings are comfortable and glamorous. The ring on the left is a variation on the traditional BCR, with a slim jewelled insert instead of a captive ball. The other two are known as ‘huggy rings’ and have a hinged section. They all give you a very different look from a BCR – perfect if you’ve had your piercing for a while and fancy a fresh new look. This entry was posted in Belly (Navel) Piercings, Navel Bananabells, Surgical Steel Body Jewellery and tagged Belly Button Bar, Belly Button Bars, Belly Button Jewellery, Belly Button Navel Ring, Belly Button Navel Rings, Belly Button Ring, Belly Button Rings, Navel and Belly Button Jewellery on March 17, 2012 by Piercing Guru. We’ve taken a look at some of the most jaw dropping, cutting-edge designs of belly button navel rings to best compliment your navel piercings. By wearing appropriate belly button navel rings for your outfit, you can help bring a look together and feel great at the same time. There are so many great designs of belly button navel rings to choose from that it was difficult to select our favourites, but here are a few to try out. We thought you might like this bright and glamorous gold plated star gem body spiral, to lighten your look whilst adding a delicate touch of style. 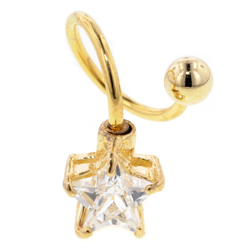 The star shaped clear jewel sparkles in the light beautifully and the gold setting will compliment your whole navel area, you can also use it in helix or pinna piercings. Featuring a hand-finish the gold plated star gem body spiral will not irritate piercings and is suitable for healed areas, which you want to show off. This entry was posted in Balls and Accessories, Belly (Navel) Piercings, Gold Body Jewellery, Titanium Body Jewellery, Types of Jewellery and tagged Belly Button Jewellery, Belly Button Navel Rings, Belly Button Rings on October 18, 2010 by Piercing Guru. Chic and edgy is all very well but sometimes you just need a dose of pure candy sweetness. Cute belly button rings are a great way to get your girly style fix and they are a really cheap way to update your look. I don’t wear girly colours a lot but lately Iâ€™m really feeling the cute bubblegum hues. A candy pink dress is a little beyond my style remit but a few well placed accessories have been a great way to give my regular style a cutesy twist. If you want cute, you’ve got to start with proper girly pink! These pink belly button rings are ultra sweet and they look gorgeous with any outfit. For real princess style my favourite has to be the glittery pink heart belly button ring in the centre. The heart is slightly translucent and really sparkles – it looks just like candy. The kitten belly button ring is really eye-catching but if you want to keep it simple I recommend the neon pink belly button ring. Itâ€™s only Â£2.95 and the practical shape means that you can wear it every day. This entry was posted in Belly (Navel) Piercings, Navel Bananabells and tagged Belly Button Bar, Belly Button Bars, Belly Button Jewellery, Belly Button Navel Rings, Belly Button Piercing, Belly Button Ring, Belly Button Rings on October 12, 2010 by Piercing Guru. Whether you are looking for a simple everyday belly bar, a fancy one for special occasions or a sensitive belly bar for a sore piercing, black belly bars are a great choice. Black belly bars look stylish and come in a huge choice of designs. You can also find black belly bars in a choice of materials, which is ideal if you have sensitive skin or metal allergies. Jewelled black belly bars are perfect for when you need a little extra sparkle. You can get belly bars with black jewels or black belly bars with jewels in various colours. I find the combination of sparkly jewels and black looks glamorous but not too flashy â€“ the black keeps them looking sleek and sophisticated. 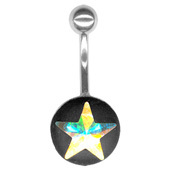 The black belly bar on the left is one of our best-sellers here at Body Jewellery Shop. It features a star-shaped Swarovski crystal set in a plain black ball â€“ like I said, glamorous, sleek and totally gorgeous. This entry was posted in Belly (Navel) Piercings, Navel Bananabells and tagged Belly Bar, Belly Bar Jewellery, Belly Bars, Belly Button Bars, Belly Button Jewellery, Cute Belly Bars, Navel and Belly Button Jewellery on August 28, 2010 by Piercing Guru.